Open the door and step into the garden with Mary . . . A beautiful edition of the classic story, with cover art by Jillian Tamaki. After losing her parents, young Mary Lennox is sent from India to live in her uncle’s gloomy mansion on the wild English moors. She is lonely and has nobody with whom to play, but one day she learns of a secret garden in the grounds that no one is allowed to enter. Then Mary uncovers an old key in a flowerbed – and a gust of magic leads her to the hidden door that reveals a world she could never have imagined. 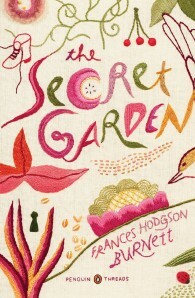 Published to coincide with the 2011 centennial of The Secret Garden‘s publication, this Penguin Threads edition of the classic children’s tale includes cover art by Jillian Tamaki and deluxe french flaps. Commissioned by award-winning Penguin art director Paul Buckley, the Penguin Threads series debuts with cover art by Jillian Tamaki for three gift-worthy Penguin Classics. Sketched out in a traditional illustrative manner, then hand stitched using needle and thread, the final covers are sculpt embossed for a tactile, textured, and beautiful book design that will appeal to the Etsy(tm)-loving world of handmade crafts. The Penguin Classics Deluxe series has been celebrated for its unique packaging and innovative design. The books of the Penguin Threads series will make truly special gifts and will be welcome additions to any craft or literature lover’s collection.